The final document of the Summit of the peoples summarizes the main points discussed during the plenary sessions and meetings, as well as express the intense mobilization that occurred during this period – 15-22 June – that point of convergence around the structural causes and false solutions, solutions to the crises facing the people, as well as the main axes of struggle for the next period. The syntheses were approved in plenary integrate and complement this policy document for the people, movements and organizations can continue to converge and deepen their struggles and building alternatives in their territories, regions and countries all over the world. Social and popular movements, trade unions, people, civil society organizations and environmentalists from around the world present at the Peoples’ Summit in Rio +20 for Social and Environmental Justice, lived in the camps, the mass mobilization, in the debates, the construction of the convergences and alternatives, conscious that we are subjects of a different relationship between humans and humans and between humanity and nature, taking the urgent challenge of halting the next phase of restoration of capitalism and build through our struggles, new paradigms of society. The People’s Summit is the symbolic moment of a new cycle path in the global struggles that produces new convergence between women’s movements, indigenous peoples, blacks, youths, farmers / peasants and the family, trabalhadore / as, traditional communities and peoples, Maroons, fighters for the right city, and religions around the world. The meetings, demonstrations and great march of Peoples were the moments of maximum expression of these convergences. The multilateral financial institutions, the coalitions in the service of the financial system, as the G8/G20, corporate capture of the UN and most governments have demonstrated irresponsibility with the future of humanity and the planet and promoted the interests of corporations in the official conference. In contrast to this, the vitality and strength of demonstrations and discussions at the Summit of the Peoples strengthened our conviction that only the people organized and mobilized can rid the world of corporate control and financial capital. Twenty years ago the Global Forum, also held in Flamengo Park, denounced the risks which humanity and nature ran with privatization and neoliberalism. Today we say that, besides confirming our analysis, there were significant setbacks in relation to human rights already recognized. 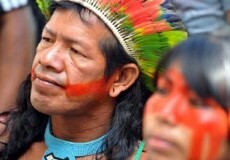 The Rio +20 repeats the script failed false solutions advocated by the same actors who caused the global crisis. As this crisis deepens, more corporations move against the people’s rights, democracy and nature, kidnapping the common property of mankind to save the financial-economic system. The multiple voices and forces that converge around the Summit of the Peoples denounce the true structural cause of the global crisis, the capitalist system of patriarchal, racist and homophobic. Transnational corporations continue to commit their crimes with the systematic violation of the rights of people and nature with impunity. Likewise, advance their interests through militarization, criminalization of livelihoods of people and social movements promoting deterritorialization in the field and in the city. Likewise denounce the historical environmental debt that affects mainly the oppressed peoples of the world, and it should be assumed by the highly industrialized countries, which at the end of the day, were the ones who caused the multiple crises we have today. Capitalism also leads to loss of social control, democratic and communitarian them on natural resources and strategic services, which continue to be privatized, turning rights into commodities and limiting the access of people to goods and services necessary for survival. The so-called “green economy” is one of the financial terms of the current phase of capitalism that also makes use of old and new mechanisms, such as deepening of the public-private debt, the super-stimulus to consumption, ownership and concentration of new technologies , carbon markets and biodiversity, land grabbing and land foreignization and public-private partnerships, among others. The alternatives are in our people, our history, our customs, knowledge, practices and production systems, we must maintain, upgrade and achieve scale project as counter-hegemonic and transformative. The defense of public spaces in cities with democratic governance and popular participation, cooperative and inclusive economy, food sovereignty, a new paradigm of production, distribution and consumption, the change of the energy matrix, are examples of real alternatives to the current system agro-industrial-urban. The defense of the commons is guaranteed by a series of human rights and the nature, solidarity and respect for different worldviews and beliefs of peoples, for example, the defense of “Living Well” as a way to exist in harmony with nature, which presupposes a just transition to be built with workers / and the people. We require a just transition which implies the expansion of the concept of work, recognition of women’s work and a balance between production and reproduction, so this is not an exclusive assignment of women. Still passes for freedom of organization and the right to collective bargaining, as well as the establishment of a broad network of social welfare and protection, understood as a human right as well as public policies that ensure decent work forms. We claim feminism as a means of building equality, women’s autonomy over their bodies and sexuality and the right to a life free of violence. Likewise we reaffirm the urgency of the distribution of wealth and income, combating racism and ethnocide, the guarantee of right to land and territory, the right to the city, the environment and water, education, culture, freedom of expression and democratization of the media. The strengthening of diverse local economies and ensure the territorial rights of the community building the most vibrant economies. These local economies provide sustainable livelihoods local, community solidarity, vital components of ecosystem resilience. The diversity of nature and its associated cultural diversity is the foundation for a new paradigm of society. People want to determine what and whom they are intended for common goods and energy, and take control of their democratic and popular production. A new energetic model is based on decentralized renewable energy and making energy for the population and not to corporations. For the construction of the WORLD DAY OF GENERAL STRIKE. Let us return to our territories, regions and countries to build animated required to follow convergences fighting, resisting and advancing against the capitalist system and its old and renewed ways of reproduction. Rio de Janeiro, 15 to 22 June 2012. Peoples’ Summit for Social and Environmental Justice in defense of the commons, against the commodification of life.